RUTHERFORD, August 14, 2008 — There’s a marvelous revival of poetry underway in Rutherford, NJ, home of the influential American poet William Carlos Williams. A Symposium on WIlliams has led to a poetry cooperative, several websites, two ongoing workshops, and a monthly reading. The RUTHERFORD RED WHEELBARROW POETS ANTHOLOGY is the living proof of the great vortex of poetic energy that has been created. The book features an unpublished poem by WIlliams and also poets like JOHN BARRALE, CELINE BEAULIEU, SONDRA SINGER BEAULIEU, GEORGE DE GREGORIO, MARK FOGARTY, JIM KLEIN, LOREN KLEINMAN, ZORIDA MOHAMMAD, DEBORAH SCHANTZ, CLAUDIA SEREA and many more! 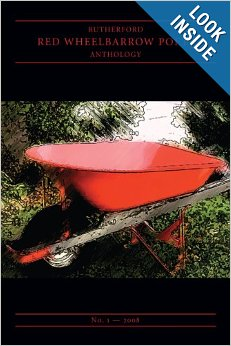 The RUTHERFORD RED WHEELBARROW POETS ANTHOLOGY is available at lulu.com and amazon.com. Ebook available here.